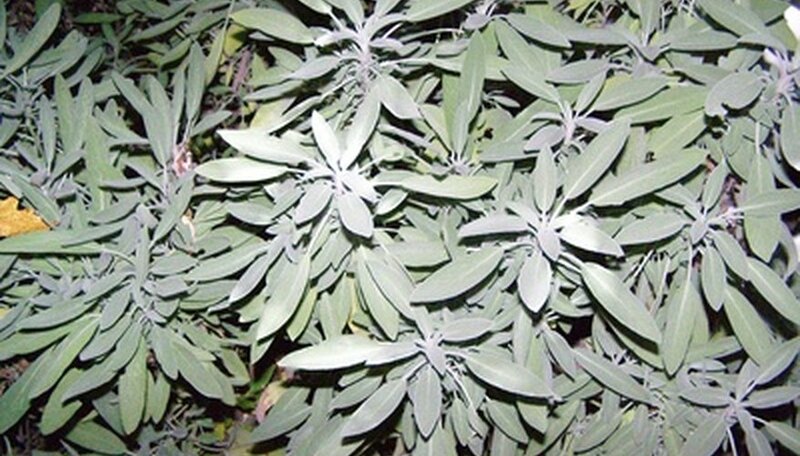 White sage (Salvia apiana) is a low-growing aromatic shrub that is indigenous to California. It grows to between 2 1/2 to 3 feet tall and produces lavender-white blossoms. Historically, white sage was used by Native Americans for its value as a medicinal herb as well as purification ceremonies. Growing white sage by seed is easy and will reward you with fragrant, attractive plants for your herb garden. Scoop into planting packs a good quality seed raising mix until each of the cells in the packs are filled to within a quarter inch from the top. Plant white sage seeds about four to six weeks before the last spring frost in your area. Pour water into a watering tray or any tray-like container that can hold about 1 to 2 inches of water. Place the planting packs into the container and let the germinating media become saturated with water. You can purchase a watering tray at your local garden center or plant nursery. Plant two to three white sage seeds onto the surface of the soil in the planting packs. To ensure good seed-to-soil contact, press the white sage seeds into the soil using the blunt end of a pencil. Sprinkle approximately an eighth to a quarter inch of milled sphagnum moss over each of the white sage seeds in the planting packs. Sphagnum moss can help prevent the white sage seeds from dying of a fungal disease referred to as damping off. Damping off will cause the seeds to rot. Transfer the tray of planting packs to the warmest place in your home where the temperature will remain between 68 to 86 degrees Fahrenheit. Keep the soil in the planting packs just barely moist, add water to the tray when the soil is dry to the touch. Germination of white sage seeds will begin in approximately 14 to 20 days at the above conditions. Transplant the white sage seedlings into an area in your garden when they are about 3 to 4 inches tall. Choose a sunny area for planting the white sage seedlings. Dig planting holes for the white sage seedlings that are the same size as a cell in the planting pack. Dig the holes so they are about 14 to 16 inches apart. Remove a white sage seedling from a cell in the planting packs. Use your thumb and index finger and push up from bottom of the cell. Set the white sage seedling into a previously dug planting hole. Scoop in soil in and around the white sage seedling to fill the planting hole full of soil. Water each of the white sage seedlings using a starter solution fertilizer such as 4-10-3. Make sure you follow the directions on the product label so you will know how much of the fertilizer to add per gallon of water. Keep the white sage seedlings just barely moistened. Let the soil dry out some in between watering. Once white sage becomes established it is drought resistant and requires only minimal watering.